Tucked between the Cannon River and Northfield’s bustling main street, the Archer House River Inn is an upscale retreat that offers stylish accommodations, modern amenities, and facilities, including two full-service restaurants, a riverside lounge with full bar, an event space for up to 100 guests, and five-star hospitality and service. 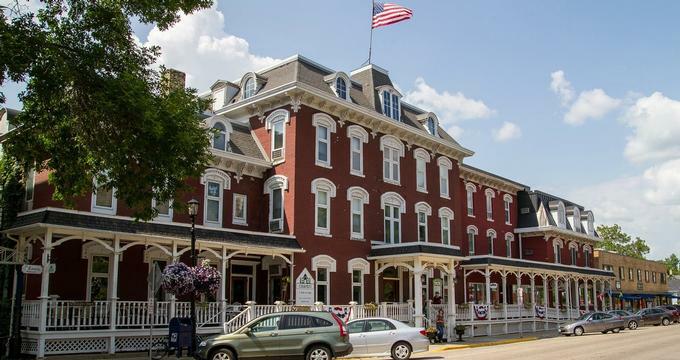 Built in the French Second Empire style with a stately red brick façade, arched dormer windows, and beautiful mansard roof, the inn dates back more than a century when it opened in 1877 as a luxury hotel for discerning guests. The Inn features 36 well-appointed guest rooms and suites with private bathrooms, comfortable furnishings, and modern amenities. The Inn features two restaurants, a coffee shop and eatery, a lounge with an outdoor deck overlooking the river, and two gift shops, as well as event space for special occasions or up to 100 guests. The Archer House River Inn features 36 beautifully appointed guest rooms and suites, ranging from Cozy, Large, and Executive Rooms to Two Room Suites. All of the accommodations have comfortable queen or king-size beds with pillowtop mattresses, 300 count cotton sheet and deluxe duvets, and private or en-suite bathrooms with bath/shower combinations, plush towels and bathrobes, and organic bath amenities. In-room conveniences include 32-40” LCD TVs with cable channels, hair dryers, irons and ironing boards, and complimentary wireless Internet. Cozy Rooms feature double or queen-size beds and en-suite bathrooms with a walk-in shower and porcelain claw foot tub, while Large Rooms have queen-size beds and en-suite bathrooms with deep soaking tubs, or whirlpool baths, and walk-in showers. Executive Rooms feature two queen-size beds and en-suite bathrooms with deep soaking tubs or whirlpool baths, and walk-in showers and deluxe Two Room Suites have one king or two queen-size beds, en-suite bathrooms with deep soaking tubs, or whirlpool baths, and walk-in showers, and spacious sitting areas with sleeper sofas. The top floor of the Archer House features the three-room King Suite. This luxurious abode has a master king bedroom with an en-suite bathroom, and two large bedrooms with queen-size beds with en-suite bathrooms, which can be rented as one unit or separate bedrooms. The bathrooms have walk-in showers and soaking tubs/whirlpool tubs, plush towels and bathrobes, and designer bath amenities. The gorgeous suite also features a Great Room with comfortable seating, a sleeper sofa for additional guests, a dining table for six, and a fully equipped kitchenette with refrigerator and microwave. The suites/rooms can be rented together or separately and are accessed via a stairway from the third floor. The Inn has two on-site restaurants that serve delicious, freshly prepared cuisine in a relaxed, friendly setting. Chapati Cuisine of India serves northern Indian fare, including a wide variety of vegetarian dishes, meat, and seafood dishes, along with craft beers and fine wines. The Tavern Of Northfield is open for breakfast, lunch, and dinner and offers a scratch-made menu of hearty entrées and vegetarian fare, along with homemade soups and sauces, freshly baked bread and decadent. The Archer House River Inn offers amenities and facilities that include a guest exercise room with state-of-the-art equipment, a banquet and conference room for up to 100 guests, two restaurants, a coffee shop and bakery, and a tavern lounge with a riverside deck. Two gift shops sell clothing, handbags, jewelry, and other trinkets and gifts, and there is complimentary wireless Internet throughout the property. The riverside town of Northfield offers an array of activities and attractions for the whole family to enjoy from hundreds of acres of urban and recreational parks to hiking trails, performing arts, and golf courses. Northfield is home to several excellent museums, galleries, and theaters for culture-lovers and hosts a variety of events and performances through the year. Other favorite activities include hiking the famous Jesse James Outlaw Trail, visiting one of the many historical sites peppered around the city, or picking apples and berries at one of the nearby farms. Attractions include the historic downtown district, Carleton College’s Japanese Garden, the striking St. Olaf College campus, and the Riverwalk along the banks of the Cannon River. The Archer House River Inn is available to use for special occasions such as bridal showers, engagement parties and wedding ceremonies, and offers exclusive wedding services and packages, such as award-winning catering and culinary services, and professional staff is on hand to assist with all the details on the special day. An exclusive Romance Package includes a chilled bottle of sparkling wine, two logo-etched champagne flutes and gourmet chocolates, discount vouchers for the Inn’s gift shops, and the Tavern Restaurant.